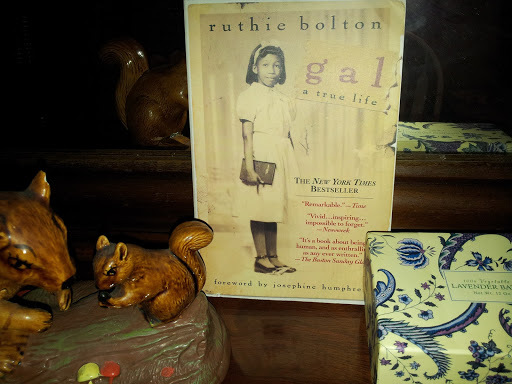 This passage was taken from page 150 of Ruthie Bolton’s biography, Gal: A True Life. Having came across it a couple of hours ago, I stopped to read it again and again because I felt something both saddening and highly inspirational. Placing aside all that the book has to offer in terms of her bravery within her horrific family situation (I don't mean that as a disregard when there is much to discuss), this passage stuck inside of me like a plug in a socket. I recall Oprah’s "Ah-ha" catchphrase lighting up my thoughts. While a host of conversations are in my head that I can draw from this passage and relate to my life, I believe the number one shining thought is that God/the Universe is always there for us. He/She/It (whatever have you) is most certainly on your side and all you have to do is ask, believe, and show up. From there we watch a path be revealed to us as we keep walking, even in times when we think absolutely nothing is happening or that there are more blocks than avenues. It makes me think about those days where I feel so unproductive because I simply am not sure what it is that I need to do. Today was one of those days, so I decided I would read until something came to thought. Now here I am blogging what I felt was a significant piece of information guided my way. That's one more blog entry of me "showing up" and trusting that someone else gets it. So that I would not forget this passage from this incredible book, I wanted to tack it on my blog as that perfect reminder of how life truly speak to us in times when we just need to sit down, quiet ourselves, and listen. Then it's back to hitting the pavement and showing up. Bolton, Ruthie. Gal: A True Life. New York: New American Library, 1994. Print.